The attraction to Santa Catalina, Panama is its natural beauty and vast natural resources. With the Pacific Ocean roaring up on its beautiful black sand beaches, Santa Catalina is the launching point for fantastic nautical adventures and a serene fishing village. Surfing has for decades been the main draw for visitors to Santa Catalina. But the reason Santa Catalina exists is its access to abundant fish populations. Fishing and scuba diving are rapidly growing in popularity. The same type volcanic outcroppings that create the incredible surf break at Playa Santa Catalina, create excellent dive and fishing spots just offshore. A short boat ride from shore delivers the diving and angling enthusiast enormous populations of fish and underwater structure. Dozens of islands are scattered through out the ocean, just a short boat ride from Santa Catalina. Many of these islands offer relatively unexplored white sand beaches with surf breaks that equal and sometimes better the world renowned break at La Punta in Santa Catalina. On land, Santa Catalina offers beautiful beaches, good food and affordable accommodations. Visitors to Santa Catalina come for outdoor recreation and relaxation. While there are a number of gathering spots for evening dinners and socializing, Santa Catalina is not the all night party spot found in a lot of Central American surf destinations. The person wandering the beach at 5 am is more likely an early bird surfer grabbing some solo time with the waves than a straggler partier left over from the night before. With its flocks of parrots, warm waters and uncrowded beaches, Santa Catalina, Panama offers travelers the option for a quiet getaway or an activity filled vacation. Whether your ideal day is lounging undisturbed on an isolated beach or a day of scuba, surfing and playing soccer on the beach, Santa Catalina can fill your dreams. 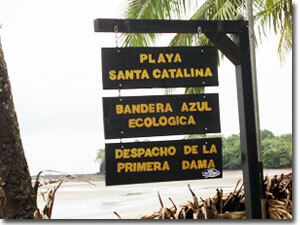 The two primary beaches in Santa Catalina are Playa Santa Catalina and Playa Estero. Both are black sand beaches produced from an adjacent river and offer gentle waves with large tide changes through out the day. While Playa Santa Catalina is the busier of the two, either can offer a pick up soccer game or other activities with the locals. The beach waters around Santa Catalina are routinely tested are have been awarded the Bandera Azul Ecologica or Ecologic Blue Banner award for their purity. 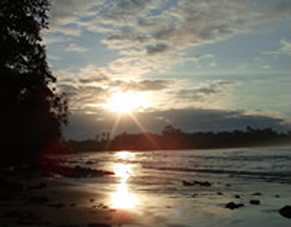 Playa Santa Catalina is the main village beach located at the end of the paved road. This is the hub of activity for the fishing village of Santa Catalina. Most of the daily scuba diving trips and fishing boats leave from Playa Santa Catalina. Directly in front of the beach is a view of Isla Santa Catalina. The adjacent river gives overnight harbor to the local fishing pangas. Playa Estero is east of town across the small river at the end of the dirt road which starts at the intersection in town by the phone booth and the Vasquez store. Playa Estero generally has less activity through out the day and is often completely empty. It offers a nice steady set of waves for body surfing or beginners to learn to surf. Except during very heavy rains, the river is only calf deep and can be easily crossed.